KUCHING: The Sarawak government has pledged another RM500,000 for the school rebuilding project of SMK St. Teresa, bringing the total state government’s contribution to RM2 million. 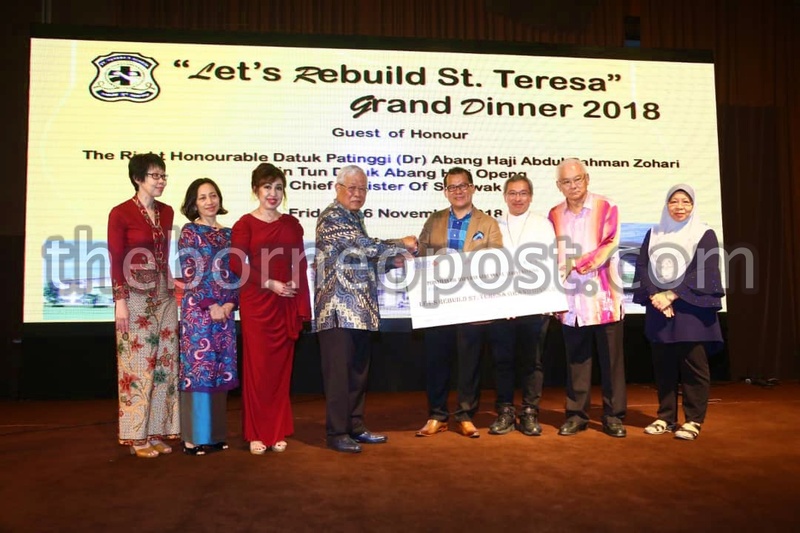 Minister of Education, Science and Technological Research Dato Sri Michael Manyin Jawong announced this special fund when representing Chief Minister Datuk Patinggi Abang Johari Tun Openg at the ‘Lets Rebuild St. Teresa’ grand dinner 2018 held at a leading hotel here last night. Prior to this, Sarawak government already granted RM1.5 million for the project which estimated cost is over RM8.2 million. A fire in late Oct 2016 destroyed the school hall, staff room, library, sewing room, music room, counselling room, prayer room, toilets and printing room. His text of speech was read out by Manyin. Among those present were SMK St. Teresa principal Mary John and Parent-Teacher Association chairman Thomas William Suip.